The road continues and we walk it. It cuts straight today, like yesterday and the day before, making slight turns then shooting forward until the bend disappears like a wrinkle ironed flat by the miles. Cars and trucks rumble past. A few honk, some wave and yell out windows. I think they are words, but at their speed the sound blurs into a scream. I imagine the people inside recognize something in us, like maybe they walked the Camino before, but I don’t know. Maybe they just want to honk and yell. Some of the big rigs have elaborate cabs decorated with lights, stuffed animals, crucifixes​, and shining signs with the drivers’ names in chrome. I imagine the pride they all have in their cabs, the little touches they’ve added over years on the road, the way they’ve made it their home. We pass a gas station attendant filling a tank, scattered houses, and small towns. The road goes on as Daya and I drift apart and together over the miles. In the shade of a pullout on a lonely stretch of road, I pass a woman sitting alone on a red chair. Her blonde hair is pulled back, her legs are crossed under a black mini skirt. A pair of leopard print platforms hang off her feet. It’s just past noon and she looks bored with it all. Our eyes meet for a moment, both of us filled with confusion. I look away and keep walking by, hoping I don’t frighten her. She composes herself and leans back in her chair to wait for more promising clients. I drift on, wondering​ what her story is, what all the stories​ along the road are. We catch glimpses of them, a few seconds to guess and imagine, to craft entire worlds around, before they disappear. I wonder what stories they craft of us too, what do they see in my bushy beard and ripped pack, what do they think of Daya a few hundred yards behind, her rainbow unicorn hat glowing in the sunlight. I walk on, making up stories as cars zoom past. Daya and I have dinner on a bench outside a grocery store. The road feeds into a bigger road and we leave it for the hills along a small, empty highway. A shepherd stops us to chat right near sunset. A herd of sheep graze in a field nearby. His four dogs sit quietly by his feet. He speaks only Portugese so the three of us do more smiling and laughing than talking. I wonder what his story is too. I bet he is still laughing about us. And the dogs are probably perplexed. I’m wondering if Daya will recognize you after you shave off your beard, or portions of it? It was a transition for me when my husband shaved off his beard – surprise! Speakin Of beard, Daniel, are you going to burn it at the end of your journey? Pilgrims often burn their socks once in Santiago (from what I’ve heard). Why not your beard ? And after having burned it, THE question : what’s next ? In Key West, it was going back home by the sea + ICW. This time, it will be… Europe West to Est ? Keep on trucking ’til South Africa ? Reading your posts is always a moment of quality. ‘Hope that Tariffa won’t be the end. I am a explorer/Traveler. And Everywhere I go, it seems I’m always wondering to myself “Will I Ever be here again” Is this just me thinking this? Or do pther explorer’s think the same thing? Its lile I can’t get enough of where I am at!! I only can Hope that some day when I die that I can float throughout all of the places I have Traveled. 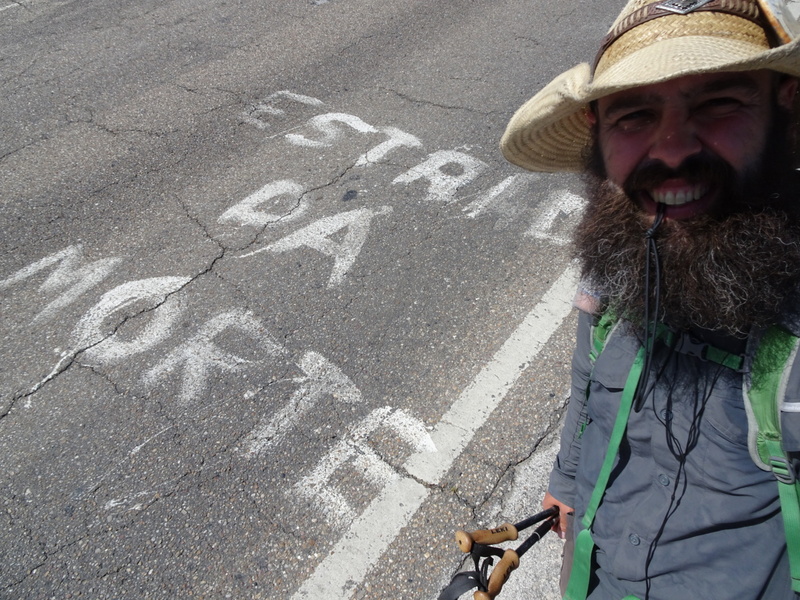 D. Your journey in southern Portagal is so different than the north and the Camino. All I remember from driving through the middle of south Portugal are the groves of cork trees. Glad you turned off the highway and into the hills. I’m sure it’s more K’s but your spirit will be better for it. Namaste.